When I read your question, one phrase in particular jumped out at me, that your Shetland pony is “on full pasture turnout where there is plentiful grass.” It’s obvious that you care deeply for your guy and only want the best for him, but in this particular situation, what’s best for him may no longer include grazing on fresh forage, unfortunately. Shetland ponies—like mustangs, Paso Finos, Morgans and some other breeds—have what’s known as a “thrifty gene.” That is, they are genetically programmed to be able to extract every last bit of nutrition out of some pretty inedible feedstuffs and actually thrive on such a diet in which most horses would lose weight. Combine this knowledge with the facts that a) many of today’s grasses have been cultivated to produce rapid weight gain in meat-producing animals like cattle and b) we contain our horses within fenced areas of very well-managed pastures, and you have the “perfect storm” of dangerous weight gain in predisposed ponies and horses. You mention that your veterinarian has examined your pony and found no physical condition for his excess weight. Of course, the condition that comes to mind in a middle-aged, overweight pony is Equine Metabolic Syndrome or EMS. There are three components of EMS: obesity, insulin resistance and laminitis. While carrying excess weight is never a good idea and can lead to many health problems, what I’m concerned about most in your case is that your pony is a ticking time bomb for laminitis, or founder. If your vet has already ruled out EMS using the standard diagnostic blood tests of resting insulin concentration and the more complicated combined glucose insulin test, there is a new “oral sugar test” that has just been developed that is easy and accurate and may do a better job of determining the underlying cause of your pony’s weight gain. It may also be time to speak with your veterinarian about adding prescription medication to a well-rounded management program that includes proper diet, turnout, exercise and supplementation. Short-term use of levothyroxine sodium (Thyro-L) has been shown to cause weight loss as well as improve insulin sensitivity. Some horses respond to the human drug metformin so definitely ask your veterinarian about it too. He or she will also be able to help you formulate the right amount of the right forage for your pony, which should be 1.5% of his ideal weight of a 10% NSC grass hay. 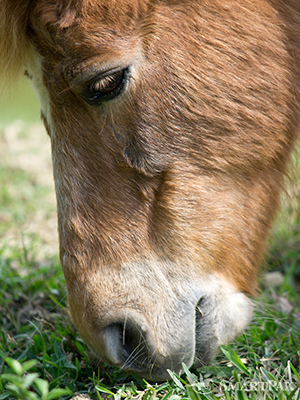 Since your pony won’t keep his grazing muzzle on (have you tried different brands?) then a dry lot is a must, preferably with a friend to keep him company and keep him moving. Either a small hole hay net or slow hay feeder would be a good addition to his paddock or stall. Your veterinarian can also tell you how much exercise is safe for your pony—even a 10 minute handwalk morning and night is better than nothing and maybe something you can build on. Finally, if you haven’t tried a supplement with magnesium, chromium, antioxidants like Vitamin E, adaptogens like ginseng, and other herbs (like cinnamon), I highly recommend you add on to his regimen. You have your work cut out for you but if you make these changes in all aspects of his life, you should see improvement soon. Best of luck to you! I have a 20+ year old POA who tends to gain weight easily and has exhibited early signs of founder when left in the pasture too long. I have been able to manage these issues with the use of small hole hay net and very limited grazing. Per my vets advice, I give her only 20-30 minutes in the pasture a day, about 4 days a week.